When Cameron Hillis took to the ice at Guelph’s Sleeman Centre last Thursday, it was in front of more scouts than he had ever played before. While scouts from across North America and Europe usually attend his OHL home games with the Guelph Storm, the Sleeman Centre recently played host to the CHL Top Prospects game, an annual showcasing of the top junior talent in the nation. The 5’11” centreman represented Team Cherry, coached by hockey legend Don Cherry, his hometown of Oshawa, and the St. Andrew’s College Saints. Playing with the varsity squad at the prep school for a better part of three seasons, putting up 77 points in 58 games in 2016-17 with the Saints, Hillis’ first year with the Guelph Storm has resulted in almost a point-per-game effort, raising his stock for this upcoming June’s NHL Draft. Despite not putting up any points in the Prospects game, Hillis contributed to Team Cherry’s winning effort with eight faceoff draw wins, and showed off the foot speed that has him within the top 50 in most NHL draft rankings. “It was definitely a lot of fun playing against the top competition and to get a chance to showcase your talents in front of a lot of scouts,” said Hillis. 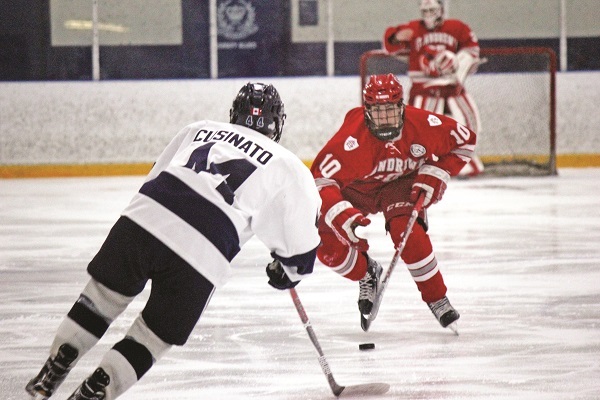 Hillis, who won an OHL Cup with the York-Simcoe Express in 2016, joined the Storm last year after deciding to forgo an NCAA college path for that of major junior hockey. Already committed to Providence College after the 2015-16 season, it was while with the varsity Saints that Hillis and his family made the decision.